The Preliminaries competition is the first real pressure point in any Big Four pageant. Just like in The Olympics, an athlete must first survive the qualifying rounds in order to deserve the opportunity to go for Gold in the finals. The agony of defeat for many Olympic athletes is failing to qualify after years of training, dieting and hard work. The same feelings apply in beauty pageants where the thrill of moving forward is always tempered by the sadness of leaving friends behind. 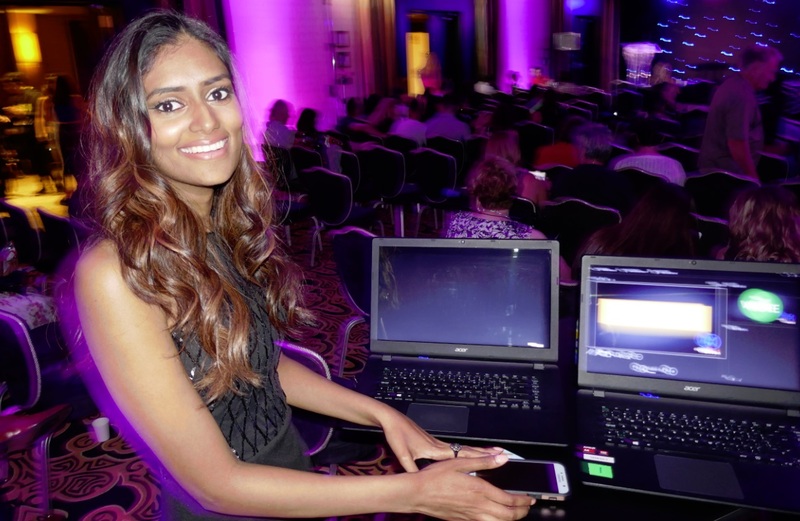 On Thursday evening July 26th, the 2018 Search for Miss World Canada staged their Preliminary Competition in 2nd floor ballroom of their Markham area hotel. Above, Mattea Henderson – Miss Intercontinental 2017, and Michelle Weswaldi greet the waiting crowd of parents and friends who have come to root for their favourite delegate at the front foyer of the hotel ballroom. What the waiting spectators didn’t know and couldn’t possibly know is that this evening was the climax of a day of intense preparations. The rudimentary dance steps learned in the intermittent training sessions heretofore were sewn together and committed to memory. The legs and feet of every delegate were aching and yet the back rooms were filled with groups practicing the steps again and again. Every delegate enjoyed at least one and probably two different healthy meals from Nutrition Balance meals delivery service. Below we can see chickpea balls in multigrain pasta, and crusted lentil cutlet in tomato sauce. There were dozens of different flavours and these vegetarian options seen here were among the left-overs still on the table. The high protein menu from Nutrition Balance is the best option for young people looking to increase protein intake, reduce carbohydrate intake and maintain necessary nutrients to prevent muscle damage. It’s good fuel for these competitors extending their personal training regimen in so many new directions at once. 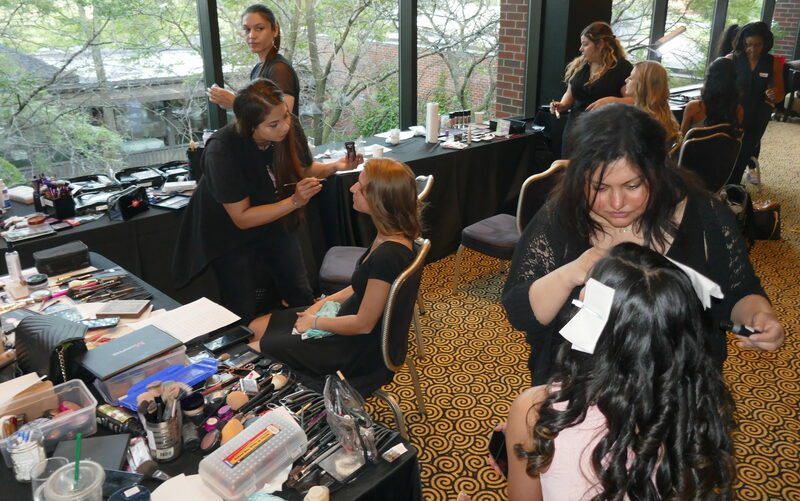 Modern Makeup is a mobile hair and makeup team that specializes in beautifying large groups of people for roles in weddings and corporate videos, and at live shows and events across the Greater Toronto Area. The annual Search for Miss World Canada is an initiative close to their big hearts, and they’re present every year and will all be on-site tomorrow at the MWC2018 Fashion Show, and on Saturday at the Grand Final. Many of these ladies attended the show afterwards, (secretly) rooting for their favourite delegates. Shawn Cuffie is the CEO of DLM Entertainment Productions, and he has become something of a thought-leader in the art of designing and executing on-stage dance performances with multimedia inserts. Shawn and his team of experienced dance instructors and technicians have been working with artists on stage and in rehearsal spaces for fourteen years. DLM Entertainment has made it possible for many young talents to make their mark in Performing Arts. DLM is a leading event design, production and entertainment company. Shawn specializes in staging dance shows, fashion shows and beauty pageants, and excels at showcasing new material, debuting new venues and launching the careers of new performers. Follow Shawn Cuffie @cuffieshawn on Instagram. The Press was given special seating at the very front of the room. Below is Lily Liao from StreetChic street fashion magazine in Canada who is working on a summary of this year’s competition. We expect to get some better quality pictures for this blog in the coming days and weeks from Lily’s cameraman seen here. Everyone in the first row of seats is important, This is where talent scouts, video producers and dress makers (seen behind Lily and her photographer), and media makers of every description sit and watch the show. Although you’d think it would be easy inside to make pictures such a well lit ballroom, it is difficult due to how pink and purple the lighting makes the subjects appear here, plus the photons play havoc with automatic camera focus and exposure settings. 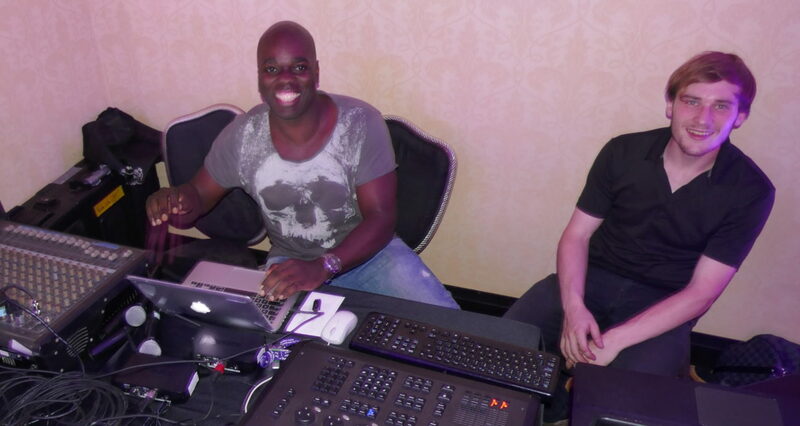 Two Judges are seen seated below, between Fernando the technical director, who is rarely spotted front of house. 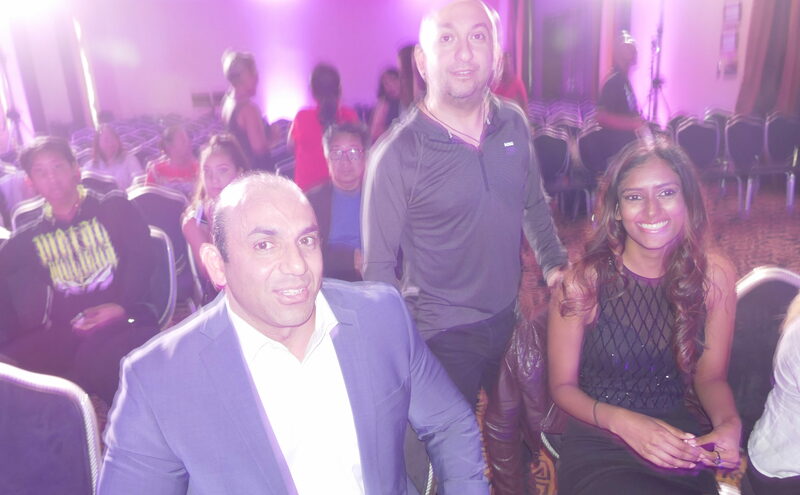 The muscular gentleman on the left is Reza Zarmehr, personal trainer and life coach behind Ultra Fitness, seated beside Christina Paruag from FemEvolve on the right. Reza was welcomed as Judge because he’s skilled at recognizing natural talent, stage presence, and true passion (or lack thereof) in young people. Genesis Multimedia for live stage shows and along with Delcino his cameraman, he makes the video inserts and runs the Judge’s automatic voting system. The notoriously quiet and soft spoken man is a genius video editor who makes product that blends seamlessly into live stage shows. Fernando is the multi media producer behind so much of the 2018 Miss World Canada competition that happens Saturday night. Every year there is a media partner who goes above and beyond the call of duty and makes her magazine available to chronicle the whole story of the summer pageant; this is exactly what Christina Paruag of FemEvolve health magazine has become to the 2018 Search for Miss World Canada. She’s working on a long narrative that will chronicle her participation and perspective on these events. Christina is also set to Judge the Finale on Saturday Night. Cynthia Menard did a terrific job as the Master of Ceremonies, introducing each of the sections and calling out the individual competitors’ numbers before they came on stage. 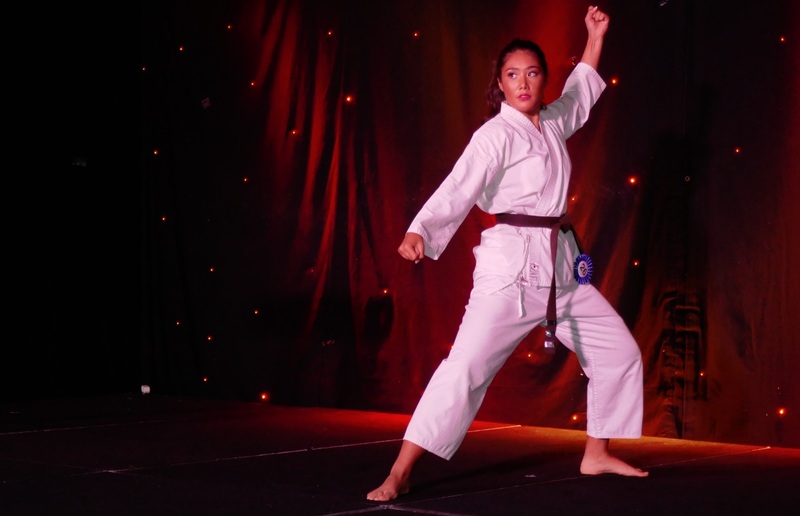 Cynthia has matured amazingly as an event host and presenter; her year of traveling after competing in China has tripled her confidence to the point where she even feels comfortable going off script, and amazingly, she even volunteered to do Karate on stage at the end of the talent show. Insert heart emoticon here. All candidates must compete in the all-important Preliminary Competition; it’s the first big make or break ordeal for these women. But the recipe for success is to present maximum confidence and create a huge stage presence. Walk those high heels right to the edge of the stage, fearlessly, and ‘present it’, and the turn, strut, turn and present. Repeat. Repeat, and exit gracefully. One of the easiest ways to see who had the most experience was to watch the route each delegate selects. There are no directions or marks on the stage so the delegates have to be super confident and walk in straight lines, always smiling, and always looking at the audience. Preliminaries consist of more than what is presented on stage. Earlier in the week each delegate sat for interviews with judges and recorded their personalized introduction video. Those interviews are important in helping shape the Judge’s opinions of each delegate. Now each competitor here tonight has the ability here to change the Judges’ opinions (by being awesome, or awful), but those interviews, plus a swimsuit and evening gown presentation on stage here determine the Top 20 semi-finalists who will compete in the ‘Coronation Night’ Grand Finale. At this point, it doesn’t matter how many selfies they have taken with fans, or how many likes they have on Instagram, or how many hours they’ve spent at the gym, suitcases they brought, and chocolate cakes they haven’t eaten. 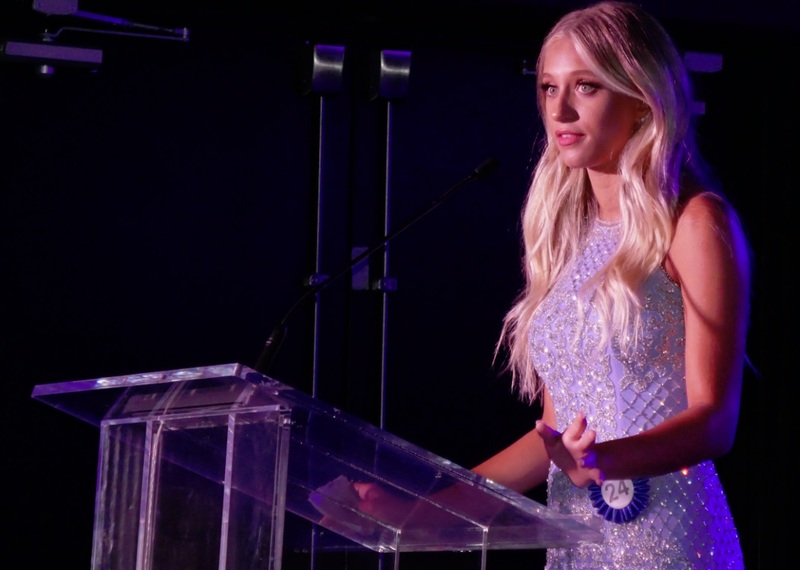 The prelims will ultimately determine the fate of the candidates going forward at Miss World Canada 2018. Highlights include Hanna’s Beauty with a Purpose speech which she delivered with common sense arguments and real courage. There was a stimulating piano and voice performance, below, and Alice Li’s amazing dance see above. The final talent performance was a karate chop performance that nobody watching will ever forget. The Preliminary Competition is that pivotal moment where the candidates need to give it their all and beat out the other 55 candidates. In reality though, each delegate only needs to be better than thirty five other ladies backstage to make it into the Top 20. Below we see Cynthia Menard and Mattea Henderson in the sashes and crowns sandwiching Lily Liao. All the scores from the 2018 Preliminary competition are kept secret until Round One of the Coronation Event (the Grande Finale) at the main Miss World Canada competition set for Saturday night. See you there. Copyright © 2016 – MTC-W Inc.